Philadelphia is a city of firsts: the first hospital, the first daily newspaper, the first zoo—they were each created within the City of Brotherly Love. 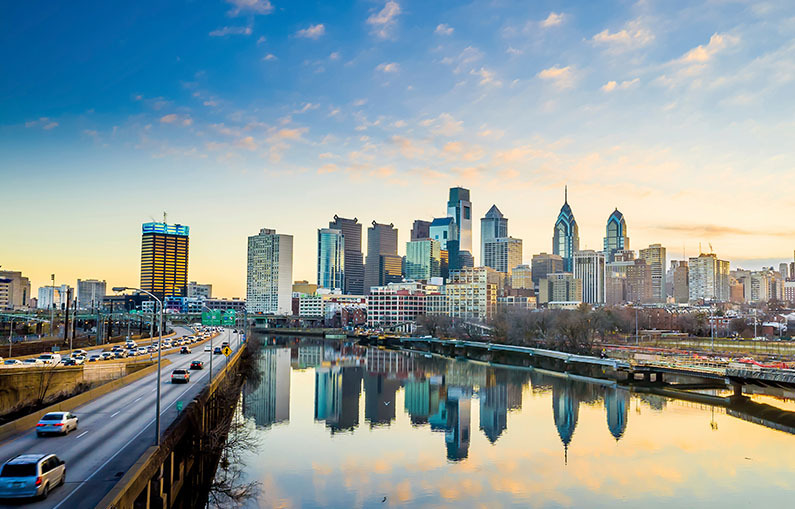 Philly’s streets are laden with history—go for a stroll (with or without a cheesesteak in hand) and you could encounter the home of Betsy Ross, the art museum staircase of Rocky’s training regimen, or the very site where the Declaration of Independence was signed in 1776. Tiffany Glass Mural, "The Dream Garden"
This hidden gem (seriously, it’s made up of more than 100,000 pieces of favrile glass)—the Tiffany Glass Mural, “The Dream Garden”—is housed in a toned-down office building near Washington Square. One of three similarly spectacular Tiffany works, this massive mosaic is a gorgeous, glittering landscape that does not disappoint. Take a break and take in this little-known work of art—a “dreamy” oasis in the midst of the Philadelphia rush. To fully experience the depth of Philadelphia’s history could take years, though The Liberty Bell is a good place to start. Possibly the most famous “broken” historical artifact, the Bell has an incredible story to tell. A signature landmark, representing the brilliant liberties of our country, this site warrants a lesson in history. Part of Philadelphia’s Mural Arts Program, the Love Letter Murals are a love letter for us all. Designed by a Philly native, this striking composition of graffiti is an expression of affection. It’s described as “a letter for one, with meaning for all,” and inspires imaginations (and hearts) worldwide. A trip to a penitentiary might not be the first item on your Philadelphia to-do list, but the Eastern State Penitentiary should definitely be in the top five. This former reformatory once held notorious criminals (e.g. Al Capone) and was a pioneering prison in its time. Today the crumbling prison offers a chilling insight into life inside a sky-lit cell. To plan your trip to Philadelphia or for an extended guide of things to do, visit the official Philadelphia city guide at http://www.visitphilly.com.